The latest version of Cartographica should begin downloading immediately. If the download does not begin in the next 10 seconds, please click on the download link. If you have downloaded Cartographica, but don't yet have a key, please go to our preview page and get yours today. 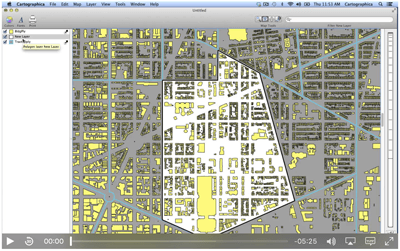 Cartographica versions 1.4 and higher require OS X 10.7.5 (Lion) or better. If you need to run Cartographica on a Macintosh running version 10.6.8, please download the latest 1.2 release. This version is no longer supported and has not received recent bug fixes. If you need to run Cartographica on a PowerPC Macintosh using Leopard (10.5.3 or higher), please download Version 1.1.4 from this page. This version is unsupported and has not received recent bug fixes.